This article explains the Abell Model or Abell Framework, developed by Derek Abell in a practical way. After reading you will understand the basics of this powerful strategy tool. What is the Derek Abell model? What company does not want clarity and insight into its customers and their customer needs? 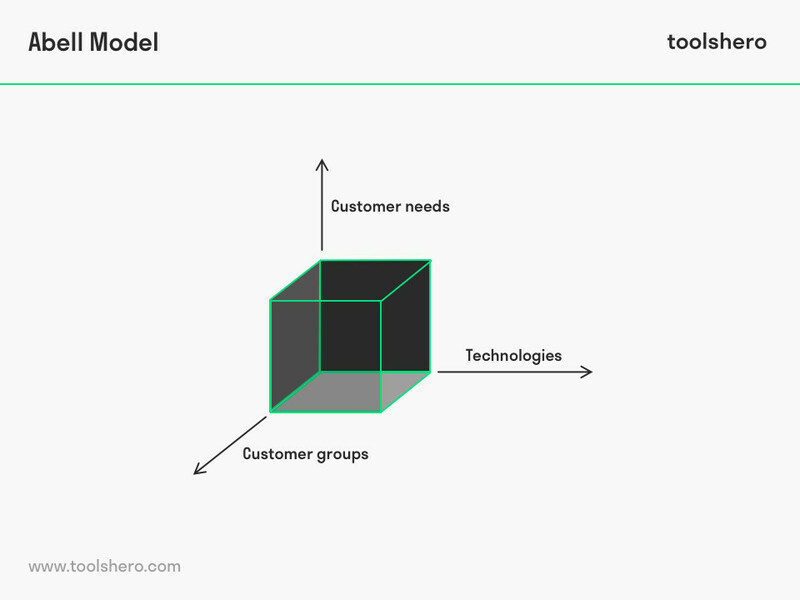 To get a good overview of the various customers and their needs and to find out exactly what technologies should be used to serve these customers, Derek Abell developed a business definition framework in the 1980s. This model is still known as the Abell Model, Model Abell or Abell Business Model. According to Derek Abell the strategic planning process is the starting principle for any given organization, and this process is defined in the mission statement. A mission statement gives direction to the organization and provides the basis for further elaboration of strategies. Who are the customers of the organization? How can the organization meet its customer needs? What techniques does the organization use to meet the customer needs? Derek Abell summarized the three questions in three axes: a horizontal axis on which he positioned the customers/ user groups, a vertical axis with buying needs and an inclined axis with the applied technologies. Therefore, an overall summary of the ‘business model’ is created in the Abell model. In the Abell Model all customer needs that are relevant to the company are identified and listed. These customer needs are determined on the basis of the product as a result of which a link is made to customer benefits. Example: A software manufacturer responds to the needs of the customer by only delivering packages that can be installed by laypeople very easily. In addition, they offer virus free software and the possibility to clean up the software on a monthly basis. They also provide clear manuals and a telephone helpline. The term ‘technologies’ should be interpreted broadly. In addition to technologies that are used to create a product, there are also technologies that are used to put a product on the market. Which marketing campaign must be used and in which way is the market research on a product carried out? Example: A software manufacturer uses the latest technologies in his software products. In addition, the manufacturer offers support to customers by means of a 24-hour helpdesk and he guarantees the best possible information provision. Marketing is all about buyers. Without buyers there would not be a market. Each organization wants to get down to the core of the buyers and therefore customer segmentation is very important. By having a thorough knowledge of the various target groups, an organization can make targeted product offers. Example: A software manufacturer delivers products to B2B and B2C customers. The manufacturer reaches these groups by deploying their own Account Managers, distributive trade, retail trade and trade associations. The Abell Model provides an organization with a quick and easy overview of the most important factors that can be used in the marketing concept. It is possible to optimize the Abell Model by sorting the different aspects of Customers, Needs and Technologies according to their degree of importance from the cross line of the three axes. The most important aspects of the Abell Model that are closest to the ‘0 axis’ will have high priority. The company will know immediately to which aspect it must pay attention first. What do you think? Is the Abell Model applicable in today’s modern economy and marketing? Do you recognize the practical explanation or do you have more suggestions? What are your success factors for a good Abell Model set up? Abell, D. F. (1993). Managing with Dual Strategies: Mastering the Present – Preempting the Future. Simon and Schuster. Abell, D. F. (1980). Defining the Business: The Starting Point of Strategic Planning. Prentice Hall. Jain, Subhash C. (2000). Marketing: Planning & Strategy (6th ed. ), Cincinnati, OH: South-Western College Publishing, pp 113-114.